We can't think of any California wineries that have much respect for a ten dollar bill. Many in Napa ask you for $20-$50 merely for the privilege of them "allowing" you to taste their wines (in hopes you'll spend the king's ransom it takes to secure a bottle of wine). We have a great selection of wines in the $6-$20 range which have character and are good examples of their type and style. We spend a lot of time and devote much effort into searching for wines which over-perform for their price. The San Francisco Chronicle printed an article on "Bargain Wines" (a few years ago now) and our little wine emporium was cited as being a Bay Area leader in value-priced wines. We've found some customers only think to come to Weimax when they're looking for a "special" bottle of wine, but please know we have really fine "everyday" bottles, too. Many stores offer "wines they can sell." Our philosophy is quite different: We feature "wines we can recommend." Heck, we like to enjoy a great wine for which we've not spent so much money. A low price does not make for a good value. A wine must be of good quality, first and foremost. 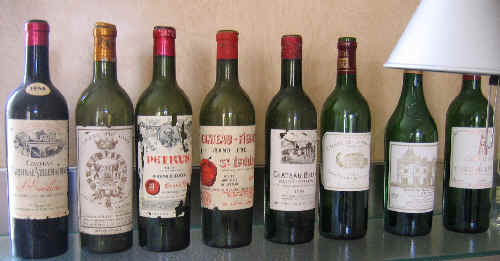 A good "value" is a wine which tastes more expensive than its price tag indicates. 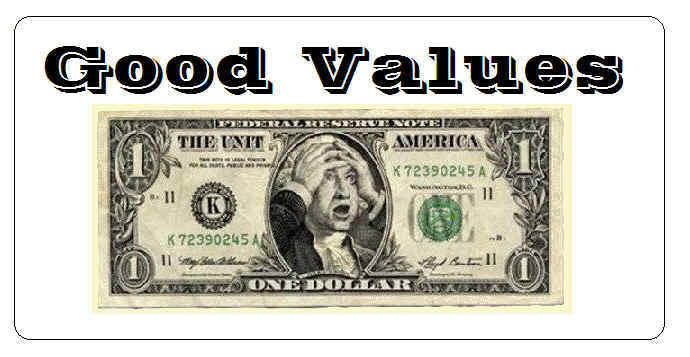 Simply being cheap does not make for "good value." We hear from some people, speaking about some famous cheap wines, "Well, it's not bad for the price." We disagree, especially when "it's not good for the price," either. 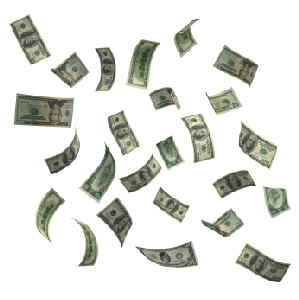 In any case, please know we have more respect for a ten dollar bill than most wine-business folks. From the Aragon region of Spain comes this amazingly "soulful" wine. It's dark in color and teeming with berryish fruit and a mildly spice note. It's a bit reminiscent of Beaujolais but with raspberry-like notes instead of strawberry. A blend of Garnacha and Tempranillo....this delicious! Please note: Aside from the fact that this is a dynamite bottle of wine for six bucks-and-change, it makes a superb Sangria! 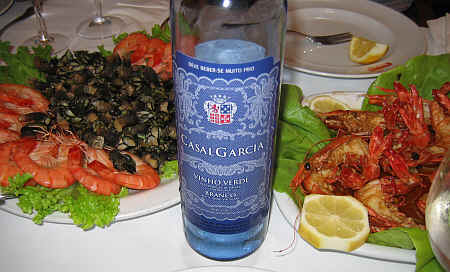 The wine is a blend of Castel�o, Aragonez and Trincadeira.. They claim it's been matured for 6 months in wood. French oak, even. We are not sure how they make such a nice little wine and get it here for six bucks, but you ought to taste it and see what you think. We're big fans of this producer. While you can buy thin, watery, sweet wine from California's Central Valley under labels such as Mondavi's Woodbridge or other weak wines. Here's a dry, medium-full bodied red of exceptional intensity in this price range. No oak. A couple of weeks' maceration on the skins, so this even has a bit of tannin! And it's dry. Here's a dynamite red wine from Portugal's Douro Valley, a region that's famous for Port. This is made of some of the same grapes that go into Port, except the wine is vinified dry. Touriga Nacional. Touriga Francesa. 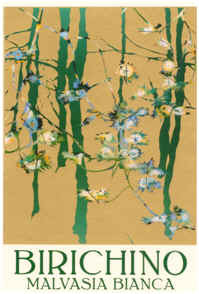 Tinta Barroca. Tinta Roriz. You'll find some wonderfully spicy, peppery notes here as we liken this to a good C�tes du Rh�ne. The importer now brings in only the "Reserva" bottling...it's a buck, or so, more expensive but well worth the price. Brothers Gaetano & Pio-Francesco Tammelini keep a rather low profile. We drove around the hills just north of Soave looking for their winery and the place is well-hidden. But damn, they make a great bottle of Soave. So many Soave wines resemble a bottle of Crystal Geyser water and then these cost $20-$30. Here's a great bottle of white wine with a remarkably fruity fragrance...peaches and melons. I brought a bottle to dinner at the home of a prominent winemaker in Italy...we were disappointed that I didn't have a second bottle in my bag as this disappeared much too quickly. Yes, it is "damned good." If you've been drinking simple Pinot Grigio, check out a bottle of this. The Fezas family owns this excellent estate in Gascony and we view this as a "top of the market" white wine from the Southwest of France. The name "Chiroulet" refers to the sound the wind makes as it whistles over the hills of their vineyards and a spalsh of this in a big wine glass will certainly whet your whistle. The wine is typically 50% Gros Manseng and then there's about 40% Sauvignon Blanc with 10% old vines Ugni Blanc. It's dry and fresh, with notes reminiscent of ripe peach along with a touch of melon-like fruit. Despite Philippe Fezas spending much of his week selling French oak barrels to the top Bordeaux wineries, this wine has no wood influence. This is one of the best dry whites from the Gascogne appellation...it's seriously good and yet costs a mere $11.99. As you can see, the bottle is standard and the label is a bit bland, even if the wine is not. There's a lot of wine made in the Rueda region of Spain, a hotbed of white wine production. Most of the wines made there are produced by large wineries and Javier Sanz' Rey Santo winery isn't exactly tiny. He owns 104 hectares of vineyards, but Sanz is a bit different than most in that he doesn't buy grapes. All the fruit is hand-harvested and it's fermented at cool temperatures to retain the mildly citrusy notes typical of the Verdejo grape. No oak. Light and dry, but fresh and flavorful. This is vinified in the style of Beaujolais, so you'll find a very fruity, berryish quality to the wine. We find it enjoyable as a picnic red and like it served moderately chilled, since it's smooth and virtually without tannin. They now are sold in a screw-cap bottle. The Dreyer family (who live close to Burlingame, actually) know the value of a buck. They also know the value of a bottle of wine. This allows a winery to obscure the origin of their Central Valley-grown table wine. Some vintners built wine bottling facilities in prestigious places such as Napa to confuse consumers and hoodwink them into thinking the California wine in the bottle may come from someplace of good quality. The grapes come from the Sonoma side of the Carneros region. The juice was fermented in oak, with 28% of the barrels being new. It's fermented to dryness and has less than 14% alcohol, so it's not a brain-buster. We like the ripe apple and pear-like Chardonnay fruit and the faintly toasty notes of the wood. Kudos the the Dreyers for offering such a good wine at such an honest price. Everyone in the town of Chignin seems to be named Qu�nard and there are signs for each Qu�nard winery as you arrive in town. 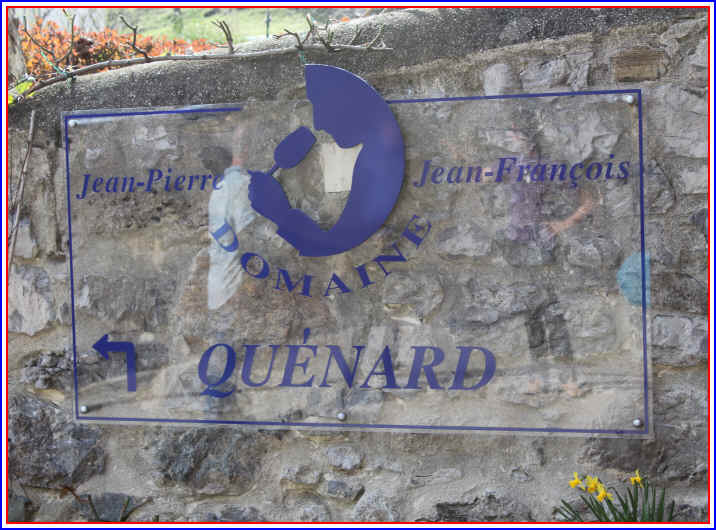 We've long been fans of the wine of Jean-Fran�ois Qu�nard...the wines are always good and they arrive here with a most attractive price-tag. The grape for the basic Chignin wine is Jacqu�re. It grows in a stony terroir on a lovely hillside that makes cultivating these vines a challenge. The wine has no oak and it's mildly aromatic and stony. We routinely order a bottle of this in a favorite San Francisco restaurant where they ask about $40 for this $12.99 bottle. But you know what? The wine is terrific and worth it. When we first tasted this well-priced Bordeaux we were delighted to find such a good wine at an attractive price. The property was owned by a fellow named Benoit Meyer and he was really serious about making good wine. In fact, we discovered he was a bit of a wine geek and we opened some bottles of far more fancy wine when we dined with him. He relished driving around the Right Bank and pointing out the really prestigious estates along the way. He knew them all and he knew their wines. This, perhaps, was one reason he made such good wine. He knew what the neighbors made and wanted to produce something worthy of comparison even though his wine sold for much less. This comes from a rather large winery in Emilia Romagna and it's not a particularly profound or exceptional red wine. It's not supposed to be profound or exceptional. Yet we have many fans who buy this as an accompaniment to a simple plate of Spaghetti & Meatballs or Lasagna...the wine simply "works" well on the dinner table (no table cloth, please!). It's a well-made, easy-to-drink, lighter bodied red wine. A fellow named Irv Bliss had visited Mendocino back in the late 1930s and was taken with the landscape. Some years later he bid on a property there, sight unseen. Apparently he felt "ignorance is bliss." Lo and behold, it was the same place he'd falling in love with on his lone visit. Bliss grew figs, had a few vines and mostly raised sheep and cattle. Today Irv's heirs make wine there and their main label is Brutocao with Bliss being their more modestly-priced wines. We were looking for a good value in California Sauvignon Blanc and narrowed it down to this and one from Sonoma's Dry Creek Valley. The Sonoma Sauvignon comes from what most would consider to be a more "noble" appellation, but we chose the Bliss wine because it was simply the superior wine. It would be easier to sell the first bottle of the other wine, but we're more interested in quality than image. This is a light, dry white...one of the few California white wines in this price category that's got some character and that's dry. Heck, we taste a lot of stupidly-priced Sauvignons that don't have this quality and yet they're expensive. 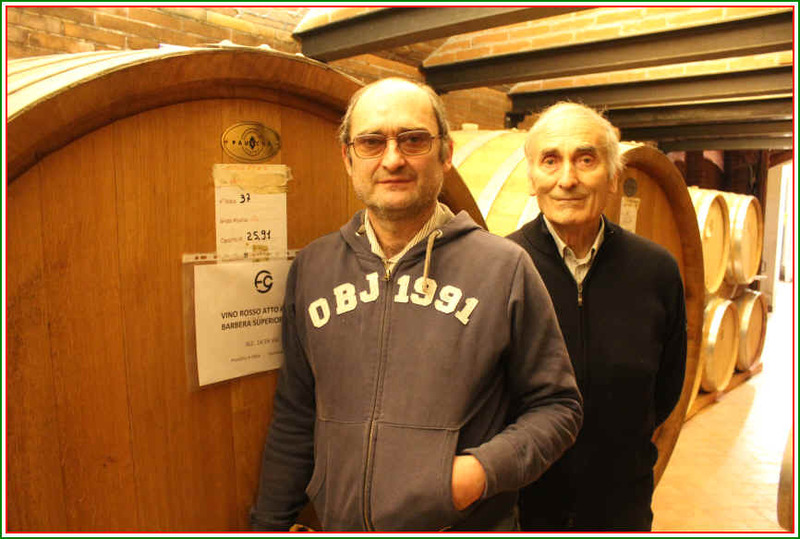 Filippo Gallino, who's in his late 70s, still keeps an eye on the vineyards and cellar tended by his son Gianni. They're in the Roero region of Piemonte and they make good, solid wines. 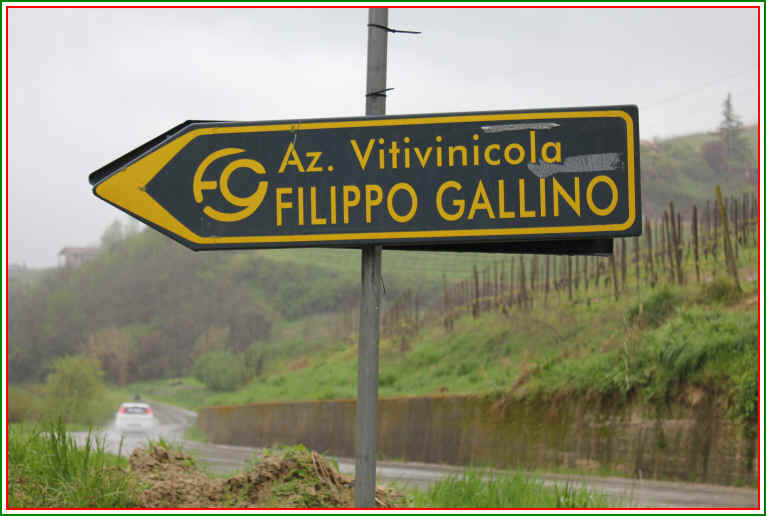 We were delighted when mentioning Gallino's name to other winemakers how all spoke glowingly about Filippo and his work. He's well-respected by his neighbors and this certainly validates the efforts made by the Gallino family. We have a small display of the Filippo Gallino Nebbiolo Langhe in the front of the shop. The wine is well-priced and it's a good example of Nebbiolo: brickish in color, light cherry notes with a mildly floral tone...bone dry, crisply acidic and moderately tannic. Given how many people come into the shop requesting low acid California wines which often sport some residual sugar, we're thrilled to see people return to buy a second (or third or fourth) bottle of this Nebbiolo. It's NOT a universally-appealing wine as it's made for Adult Palates, not kids. The snappy acidity and mild "bite" from grippy tannins is so different from the wines found in grocery stores and chain liquor stores which feature wines made at the direction of a marketing department. This Nebbiolo is made by people who "toil in the vineyards" and who make wine with the idea that it's a meal-time beverage, not a cocktail with a piece of fruit and a drinks umbrella in the glass. If we have not scared you off yet, bravo! You're likely someone who enjoys "real" wine. So come snap up a bottle of this...the price is right and the quality is in the bottle. "Wine and music make the heart rejoice"
You might know the Perrin name already as there's a prestigious Ch�teauneuf-du-Pape winery called Beaucastel that's owned by one Perrin family. This is not that Perrin. We have said those famous Perrins own Beaucastel while Roger Perrin has No-Castel. The "other" Perrin clan has a bustling business in the Southern Rh�ne, marketing a full range of wines. They do a good job of buying and selling wine. This little domaine only makes wine from their estate vineyards, tended by them, harvested by them and vinified and bottled by them. We mostly sell their wonderful Ch�teauneuf-du-Pape...it's excellent quality and the price is right. 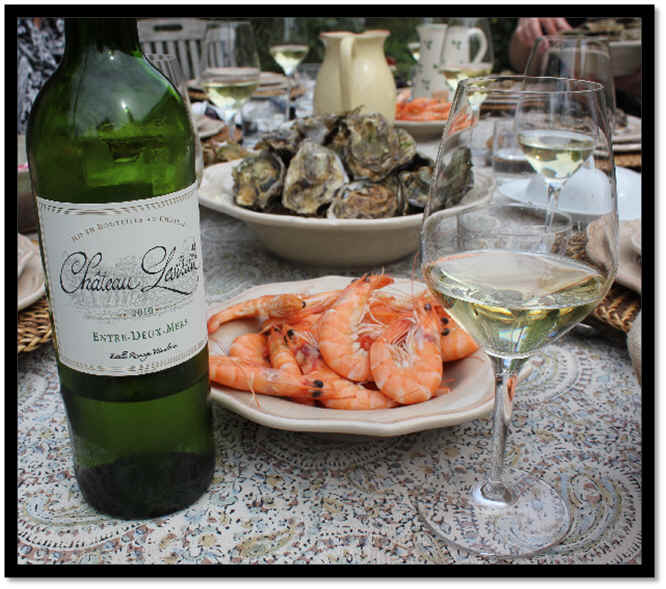 Their C�tes-du-Rh�ne Blanc has also been a winner. The vines are roughly twenty years old. It's a terrific blend featuring Grenache Blanc, Marsanne, Roussanne, Clairette and Viognier. It's this last grape that really sings nicely here as you'll detect peach and apricot fragrances. No oak. Dry. Very showy. Sure, it's not Condrieu, the prestigious benchmark wine made of Viognier, but it's not Condrieu-priced, either. The wines of Puglia don't get a lot of attention, despite the efforts of its leading independent wineries. Tuscany's Antinori family makes wine there and some are pretty nice, albeit you pay the "royalty" tax for it being an Antinori property. We prefer paying solely for the wine, frankly. 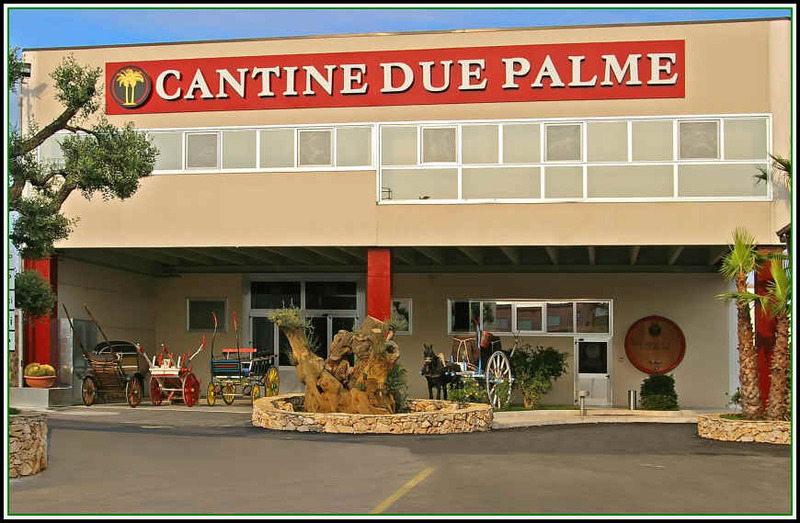 Cantine Due Palme is a relatively newish winery, founded in 1989 by a fellow named Angelo Maci. His family had a winery but her realized there's "strength in numbers" (don't the Golden State Warriors say that about their basketball team? ), so he invited 15 neighbors to join him in launching a little co-op cellar. Today there are more than a thousand neighbors participating in the Due Palme enterprise and they make some good wines. There are four cellars in this company, too, so it's not exactly a tiny family enterprise. But the average grower tends to a mere 2.5 hectares. so each vineyard site isn't exactly huge. The wines are routinely bright, dry and well-vinfied. Primitivo, as you may know, is said to be a very close cousin to Zinfandel...we'd say this combines elements of Zinfandels typically found in Lodi and Lake Counties...and it's well-priced. Medium-full bodied and fairly soft...not a wine for cellaring, this is best consumed shortly after purchase. We asked winemaker Jacky Gauthier why the winery isn't named after his lovely wife Evelyne, but after, apparently, some other woman named Colette. As a result of such a query, Gauthier and Evelyne this we are out of our mind. "Colette," you see, refers to the hill where Gauthier's home and neighboring vineyards are situated. The main thing is the Domaine de Colette wines are great examples of Beaujolais...teeming with red fruits such as strawberry tones and raspberry. The Beaujolais-Villages is a delight. Best served lightly chilled, this is as gentle as a white wine but with lots of fruity notes. Gauthier was amused and delighted when we contacted him recently to help in translating the Colette website. We told him we sell far more of his Beaujolais than we do from the famed "King of Beaujolais," Georges DuBoeuf. 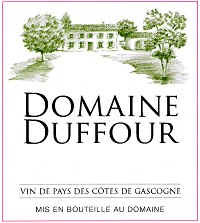 We finally informed Jacky that we do not sell DuBoeuf's wines...so, of course we sell more of Domaine de Colette. But still...this is a really good Beaujolais and it's from a steep slope with 80 year old vines. The local importer requests the wine be bottled without being filtered. The Brotte family, long-time Rhone specialists, produce this medium-bodied blend featuring Syrah and Merlot. The wine is vinified for immediate drinking, so plan on opening your bottle within 10 minutes to 2 years of purchase. We had noted a hint of a brown spice tone in the wine a few years ago, but today it's more red berry sorts of fragrances and flavors. Brothers Ernst and Thomas Loosen make so stellar Mosel Rieslings from their Dr. Loosen estate. 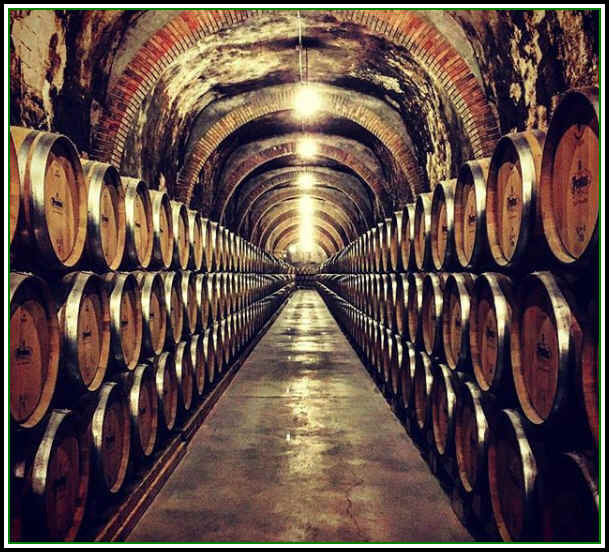 They own parcels in many famous sites and make an impressive array of impressive wines. Some years ago they had the idea of making a good, entry-level Riesling in hopes of introducing Mosel wines to a broader audience. As a result you won't find a litany of hard-to-pronounce words on this label. No �rziger W�rzgarten Grosses Gew�chs Alte Reben Riesling Sp�tlese on the bottle. Instead all you have to remember is Dr. L Riesling. The wine is floral and fruity with noticeable sweetness. However, the sugar is offset, as is normal for good German wine, with ample acidity. If you're looking for a good quality white wine with a touch of sweetness, we prescribe a bottle of Dr. L.
Here's a simple Sangiovese from southwestern Tuscany. It's made by the Mantellasi winery. The local importer designed the label which is a photo he took of four old fellows sitting on a bench discussing the latest soccer game or what they had for dinner last night. The guys don't give a damn about numerical point scores and they don't like mass-market wines made by some marketing guru who's telling the winemaker they need inky black color, fake oak and some residual sugar in the wine to appeal to people who don't normally drink wine. It's a remarkably good wine and arrives here at an honest price, thanks to a good Bay Area importer. No oak. Nice cherry-like fruit and it's terrific with simple Italian-styled foods. This producer was one of the early "ambassadors" from Portugal...We recall having their wines in the shop ages ago when Portugal was known mostly for its slightly fizzy, mass-marketed Rose wines and for its sweet, fortified dessert wine. Some of the labels from this company were even printed, not on a paper label, but on cork! They're still making good wines and the prices have escalated from three or four dollars to nine bucks. The wine is dry and not particularly tannic...ready to drink with a bit of bottle bouquet. And well worth its modest price! 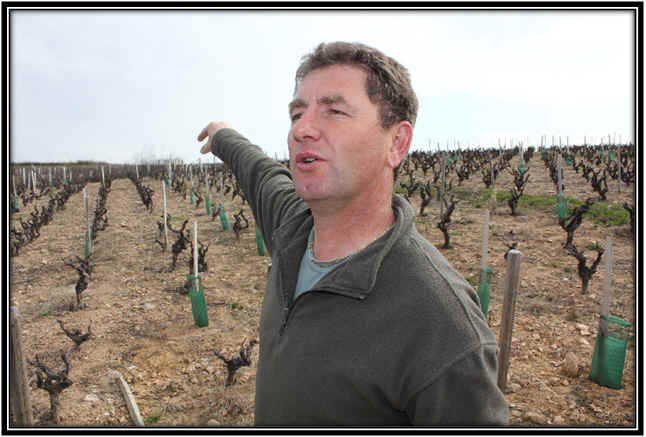 There's a large grower's co-operative in the town of Rasteau in the Southern Rhone. 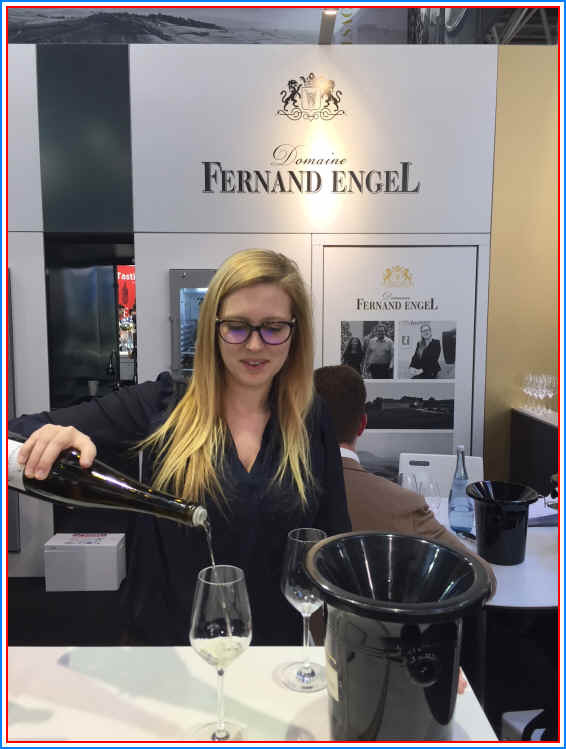 Our friend Valerie Aigron works there, having spent time out of France working in the wine biz. She's back "home" now and is one of the crew at this big producer. The Cave de Rasteau is well-regarded as a source of "good" wine and they offer it as pricing which is quite attractive. 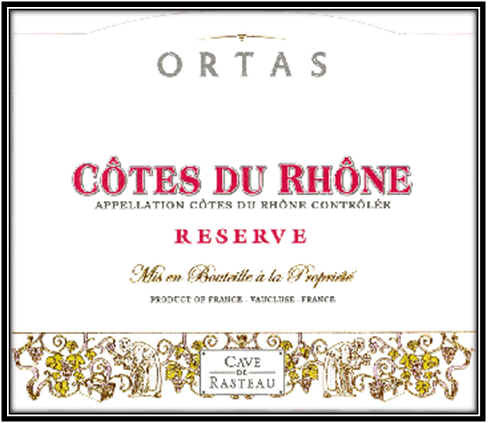 The 2011 Cotes du Rhone is not a profound, hugely complex, compelling bottle of wine. It's not intended to be so. They make this with the idea the consumer will buy it and open the screw-cap within, probably an hour or two of purchase (maybe sooner). The wine is competently made and it's grown with the idea they're making economically-priced wine, Grenache, mostly, with 20% Cinsault and 10% Carignane. It's a lighter bodied red wine, which works out well, since it's lighter-priced, too. We enjoy this served at cool cellar temp. This is a famous Portuguese white wine...it's low in alcohol, light in flavor and has just the right amount of oak...none! Muscadet is a delightfully dry, crisp, light white wine from the western part of France's Loire Valley. It's made of a grape called "Melon de Bourgogne" and this sort of wine pairs handsomely with oysters, We've enjoyed it with fried calamari, too. People who know something about French wine know Muscadet. People who know "a little bit" about wine are befuddled. Wine Shop Staffer: "If you're looking for a good seafood white that's economical, perhaps you might enjoy a Muscadet." Customer: "Oh, but we don't like sweet wines." Wine Shop Staffer: "Muscadet is actually a dry wine. It's not sweet at all." Customer: "Oh please! I know more about wine than you do. Muscats are always sweet." Wine Shop Staffer: "Never mind. Would you like to see a bottle of Kendull Jackson Chardonnay?" It costs a lot more money though. Here's a nicely made Bordeaux that's based on Merlot. It's from a 3 hectare estate which is on clay soils and is flat enough to pick the grapes using a mechanical harvester. The wine is vinified in stainless steel and they leave the skins in contact with the juice/wine for about a month. This contributes a bit of weight and intensity to the wine, though it's not a heavy or ponderous red. We enjoyed a few glasses of this with a Cassoulet...a good pairing for simple peasant cuisine for simple peasants. It's quite drinkable now and we expect the wine can last for maybe five or six years, though it's not intended for extended cellaring, so don't think you're going to have a wine such as Ch�teau Lafite-Rothschild. Domaine Guillamarine sells most of its fruit to a local grower's co-op winery, but they keep a small quantity for their own production and make this Domitia wine. Domitia refers to a road the Romans built 2100+ years ago starting in Italy and finishing in Spain. Marion and Guillaume Allies live in the Languedoc village called Pomerols and they're not far from the Bassin de Thau, a hotbed of oyster cultivation. Guess what white wine pairs handsomely with oysters? In the Occitan language the word "picpoul" translates to "lip stinger." That's likely because the wine made of the Picpoul grape used to be screamingly high in acidity. The name "District 7" is not some notion from the Hunger Games movies. It stems from California having 17 numbered grape-growing districts. Monterey is, according to the California Agriculture department, District 7. If you're keeping track, District 3 is Sonoma and Marin, while Napa is District 4. The Scheid family launched the District 7 brand some years ago and it's a reasonably-priced red that actually shows notes of Pinot Noir on both the nose and palate. It's a medium-bodied, gentle red wine. 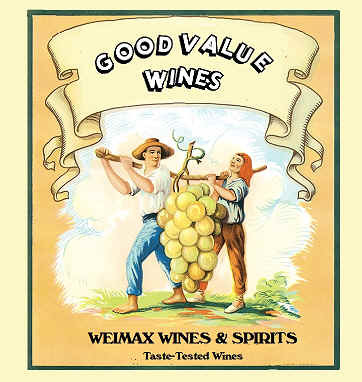 We've had maybe 4 vintages now and it remains a popular wine with Weimax customers. The Negroamaro grape is typically found in Italy's Puglia region in the "heel" of Italy's boot. The region is gaining fame as a tourist destination, but its wines lag far behind those of Piemonte and Toscana in terms of price. On the other hand, if you're looking for good value, Puglia might be a good place to start your search. Many wines from Puglia could easily be described as "rustic" in the not-too-distant past. And it's easy to find some of those sorts of wines even today if you look hard enough. But the Cantele family has been making some good, somewhat modern wines for a number of years. Thanks to Puglia being in the shadows of other wine regions, prices remain quite attractive. This is a medium-bodied red wine. It's entirely Negroamaro and the wine is fermented in stainless steel tanks before being racked into seasoned oak barrels for about half a year. It's low in tannin, meaning the wine is smooth and it's ready to drink upon release. If you're grilling some red meat or making a soulful pasta sauce, consider this as a good pairing. As it's so smooth, we like to chill it for about an hour in the 'fridge. Mariana is the name of a Portuguese girl who's widowed father farmed her off to a local convent. When she was an adult, she struck up a relationship with a French military man who was assisting the Portuguese army in battling the Spanish in a war lasting more than a couple of decades. Their relationship was eventually discovered and caused great embarrassment and somewhat of a stormy scandal. The Herdade do Rocim winery honors this bit of Portuguese history by making a wine named after Sister Mariana. It's quite a good wine, made entirely of the Alicante Bouschet grape. 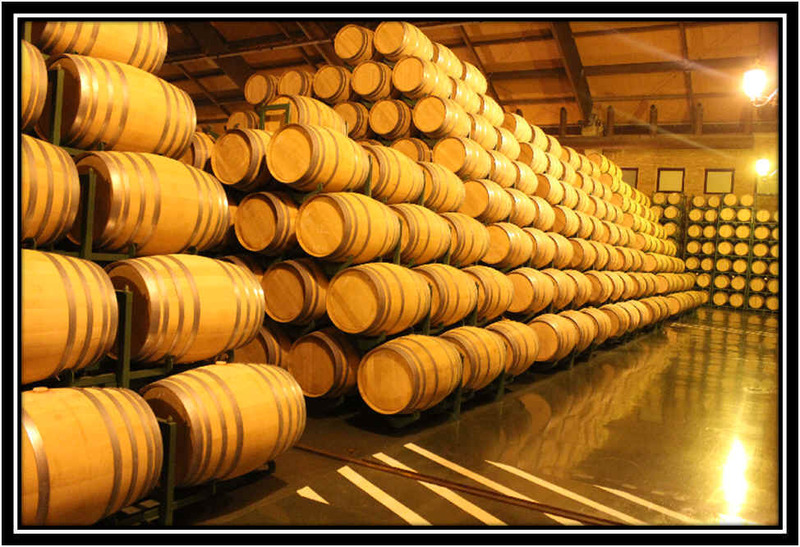 Small French oak barrels are used to mature the wine and it's fairly full-bodied without being heavy or ponderous. We like the touch of a cedary note on the nose. 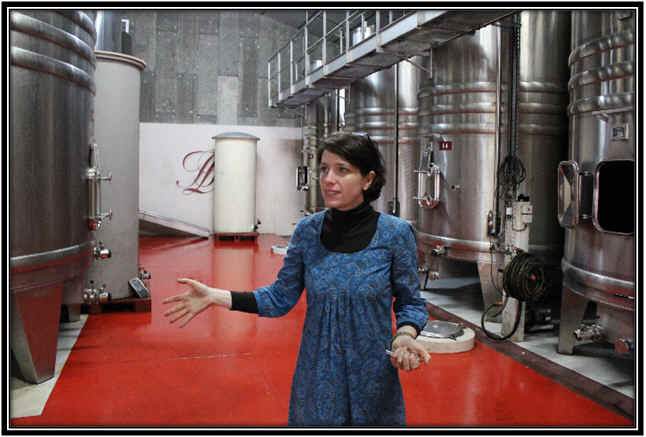 Estelle Roumage learned viticulture and winemaking from her father, Jean-Louis. She spent a harvest season in New Zealand to have a bit more experience in making wine and her simple white Bordeaux from her vineyards in the Entre-Deux-Mers appellation is routinely excellent. It's predominantly Sauvignon Blanc and the wine is fresh, citrusy and dry. No oak. The Union Wine Company in Oregon makes some good wines at affordable prices. This is typically found in most places for $12-$14. We sale price it to introduce budget-mind customers to Pinot Noir that actually tastes like Pinot Noir. It's not a fancy red, but it is easily recognizable as Pinot Noir. Most entry-level wines label Pinot Noir are rather anonymous and weak. This is a good example of Pinot and well-priced. There's a smallish grower's cooperative in the Loire near Touraine called Oisely-Thesee, a name which doesn't roll off the tongue of most American wine drinkers. We've tasted this wine for many vintages and I think the 2010 is the first one we've brought in to the shop. It's always well-made and, from our perspective, a shade skinny. The 2011 isn't a big wine, nor is it a medium-bodied Sauvignon Blanc. But for a nice, crisp, dry and light wine, this shows well, especially for it's eight-buck price. It's not as intense as our Sancerre and Pouilly-Fume wines, but most of those will set you back $17-$25. If you're steaming some clams or enjoying some fresh Dungeness crab and looking for a budget-priced bottle, this is worth trying. The Monson family has been farming in Washington State's Columbia Valley for many years and in the late 1990s they decided to plant grapes. The Monsons had been cattle ranchers before planting apples and cherries. They hired a feller named Walter Clore who's regarded as the father of the Washington wine industry. Soon they had well more than a thousand acres of vineyards. We gather they sell a lot of fruit and they make wine for their premium Goose Ridge Estate Vineyard wines and they make this daily-drinker label called Stonecap. It's a really well-made, simple version of Merlot. Now many California wines costing much more than ten bucks betray the wine-grower by displaying a decidedly vegetal, herbal fragrance. This "green" element is a result of the fruit not really being mature, despite having sufficient sugar to produce a 13 or 14% alcohol wine. There are often too many grapes-per-acre being harvested and the fruit isn't really ripe, hence the herbal or green notes. Stonecap, on the other hand, doesn't have that character and instead you'll find some red and black fruit notes. Someone told us this wine was on the by-the-glass list at a prominent San Francisco restaurant. $15 for a glass. This lovely little Spanish white wine is made in the Rueda region os Spain of the Verdejo grape. It's mildly citrusy and you might mistake it for a Sauvignon Blanc though we typically detect a note in this wine which recalls, to a small degree, the fragrance of fresh fennel. The company is today owned by a Portuguese wine enterprise and they must certainly be proud to have such a good wine in their portfolio. The grapes come from vineyards planted in the early 2000s and these are now considered "mature." The juice is fermented in stainless steel tanks at controlled, low temperatures to retain fruit. It's a dry, light white wine, made without oak. The Ducourt family have a fairly large winemaking enterprise in Bordeaux. They own something like 14 different Bordeaux estates and make all sorts of wines, nothing especially prestigious. But this white Bordeaux from the Entre-Deux-Mers region is quite attractive and it's well-priced for its quality. 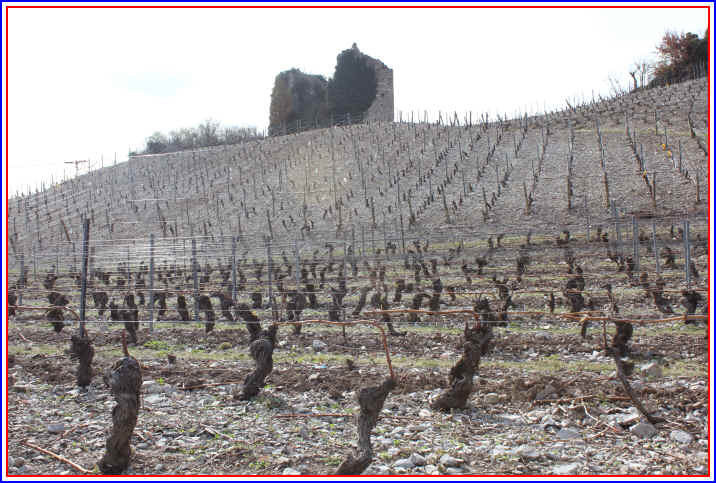 One of the Ducourt family had purchased two properties in the Entre-Deux-Mers appellation and they mostly grow red grapes. But they have 6 hectares of Sauvignon Blanc and Semillon to produce this tasty dry white and costing less than ten bucks, it's a winner. You'll find mildly citrusy notes...the Sauvignon Blanc takes center stage here. This comes from a good winery in Southeast Sicily. It's a family-operated property and they make a really charming, fruity, berryish Nero d'Avola. Some of the Nero d'Avola wines coming to the US market are made to a formula of what some marketing people think American wine drinkers want. As a result, some Nero d'Avola wines are styled similarly to Chianti, Cabernet and other red wines, losing their originality. The Case Ibidini is a medium-bodied to medium-light-bodied Nero d'Avola and it has a modest level of acidity. It's not as tart as a good Chianti. We typically chill this to about 50-55 degrees before putting it on the dinner table (or picnic table, too, for that matter). While most entry-level bottlings of Cotes du Rhone come from co-op wineries, this one is a good, smallish, family-operated place owned by a family from Burgundy. The patriarch of the family had found this property some years ago and was enchanted by the prospects of having a warm climate, summer vacation getaway. Today they farm about 50 acres, most devoted to grapes, but some to olives. We'd tasted the wines over the past decade, or so, and it's only since about 2006 or 2007 that we've felt they're on the right track. It's by far the best ten buck Cotes du Rhone in the market. Michel Duffour is a brilliant producer of white wines...this is a delightful blend, but predominantly Ugni Blanc and Colombard. Fresh, dry, and light (lower in alcohol than California Chardonnay, for example). And yet is remarkably flavorful. Nobody, tasting this without seeing the price tag, pegs this as a wine costing nine bucks. They've clearly pushed the vineyards to produce an abundant crop of Sauvignon Blanc as the wine is a bit light, but still has enough character that you won't mistake it for anything other than Sauvignon Blanc. It's dry and non-oaked and is a remarkably nice little wine for cocktail service or to pair with seafood. The wine is made entirely of Tempranillo and the wine is matured in both French and American oak barrels (about a year in wood). This is classic Rioja and for ten bucks, it's a bargain! We offer it for a low price to introduce customers to Rioja in general, hoping they will be sufficiently intrigued that they'll explore some of the $20+ bottles. This seems to work nicely, as Spain offers some remarkably good wines at sensible price levels. In Spain they'd serve this with chuletillas, small grilled lamb chops. Not a bad way to go. But this can pair beautifully with a hamburger, too, though for a mere ten bucks for the wine, maybe you could afford a small rib-eye or New York steak? 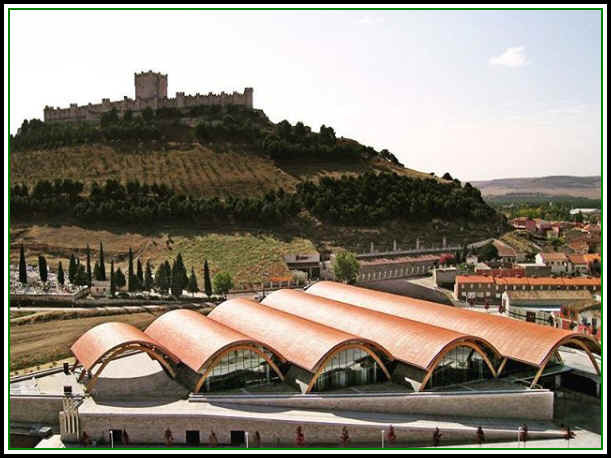 The Protos winery began in the late 1920s and today it's a rather large vineyard and cellar featuring red wines made entirely of Tempranillo or, as they call it in the Ribera del Duero region: Tinto Fino. The famous wineries of the region offer some really compelling wines but often at less-than-compelling prices. We're not saying this wine is quite as good as those from the legendary Vega Sicilia winery (plan on dropping $150 for the entry-level bottles and $300-$600 for the heavy hitter offerings), but given the $14.99 price tag of Protos' Tinto Fino that spends a year in both French and American oak barrels, you can probably survive. This displays some dark fruit notes and there's a cedary, woodsy note from the barrels. It's intended for immediate drinking, so don't keep this around in the wine rack for more than a year or two. Sonoma County fruit...Merlot, Zin and Cab Franc. A touch of oak. Smooth, medium-bodied red...they had this on the drawing board well before the current economic downturn, but then Pedroncelli has always had good wines at honest, old-time prices. It's quite good. The Orliac family makes some terrific wines in the Pic Saint Loup appellation...and we're delighted to find a really affordable little red wine from them with a name like a wolf-in-sheep's-clothing (more literally, a wolf in the sheep house). It's vinified to be immediately drinkable...mostly Grenache with some Syrah for color and body and a bit of Merlot for marketing. It's a delightful ten buck red wine...best at cool cellar temp. The Trentadue family owns extensive acreage in Northern Sonoma...their grapes go into the famous Ridge "Geyserville" wine. They make a bit of wine of their own and especially price-worthy is their simple Zinfandel-based blend called "Old Patch Red." There's Petite Sirah and Carignane in the blend as well, so it's sort of a Zinfandel-Meets-The-Rhone kind of red. Medium-full bodied and with a touch of spice. 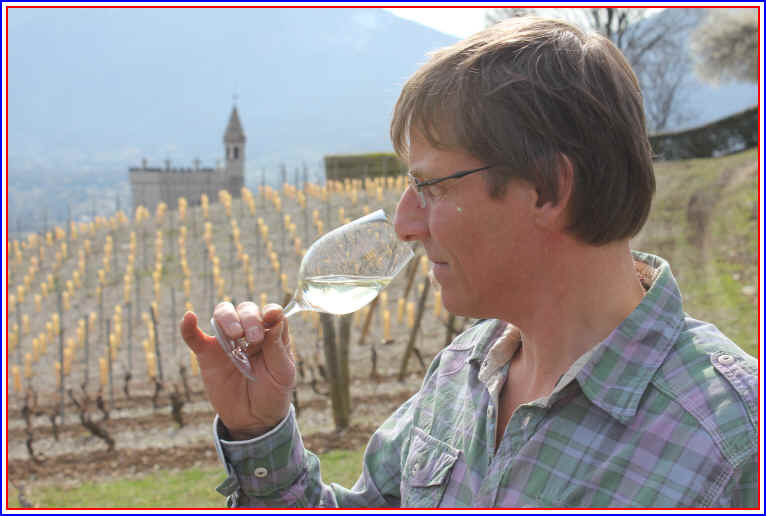 The Engel winery continues to produce really good wines in Alsace...we've been fans for more than 20 years and met winemaker Xavier Baril back in the late 1990s. Now his daughter Amelie is working in the family business and she's passionate about the world of wine. This estate flies below the radar in the world of wine and wine critics. They make a good bottle and offer it for a sensible price. As a result, European visitors flock to the cellar door and depart with cases to take back home. The brand lacks the fanfare of some of their well-marketed neighbors but the quality is good and the pricing is attractive for actual wine drinkers. This is a really good dry white from a little family vineyard and winery along the Route du Vin in Alsace...no oak. This shows a lovely appley fruit aroma and it's dry and has a modest level of acidity. It's as good as Pinot Blanc from more famous estates. The Calabria region should probably be more famous than it is for its wines, but they are not as good at marketing as they are at making wine. Most famous is the wine from the east coast along the Adriatic...the wine is called Ciro. The Librandi family does a nice job of being an ambassador for those wines (and others). Calabria's west coast is rather unheralded and unknown to all but the most ardent wine geeks. 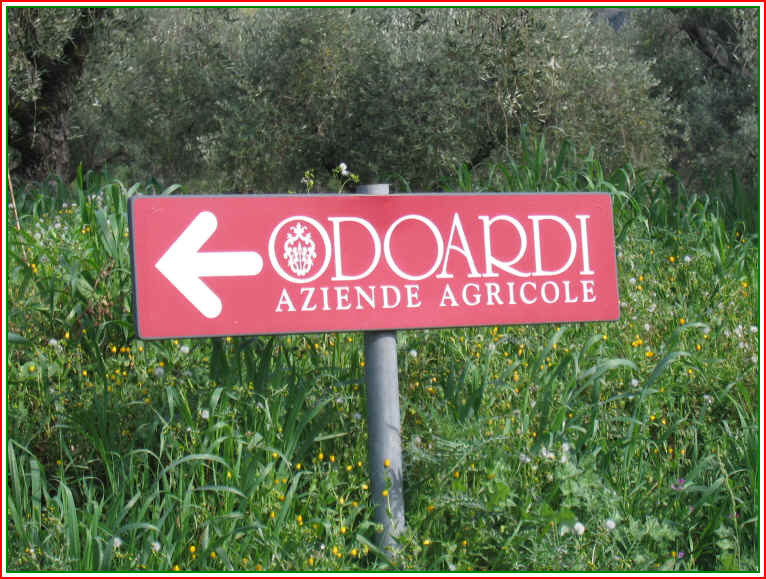 We visited some years ago and found Odoardi to be the reference point for the Savuto appellation. How could they not be? They own most of the vineyards in the appellation! Dr. Gregorio Odoardi owns the property, the current generation of a long-time Calabrian family whose origins, we're told, go back to Germany in the late 1400s. 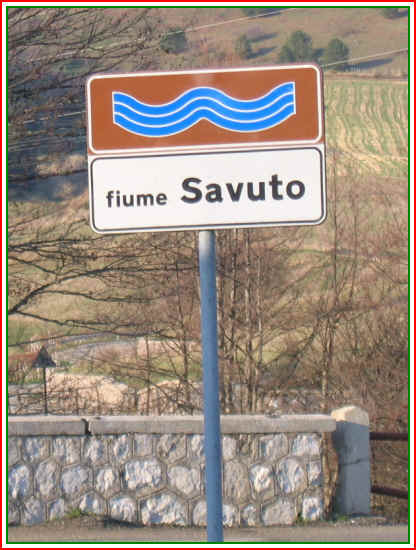 The Savuto wine is a lovely, soulful blend. It features Gaglioppo (which they call Arivino but the grape also goes by the name Cirotana in a neighboring region) with Aglianico, Magliocco, Greco Nero and Nerello Cappuccio. No Cabernet. No Merlot. No Syrah. Just good local varieites. The wine is made simply and never sees an oak barrel, yet it's harmonious and medium-bodied with mild tannins. 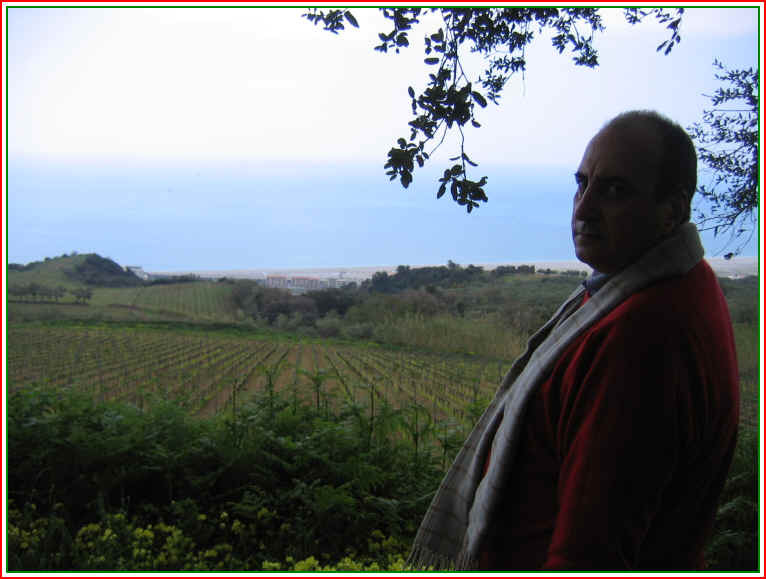 Dr. Gregorio Odoardi and some of his Savuto vineyards. Some friends of ours who live in Italy's Friuli region make this wine. A couple of years ago, we introduced the Bidoli's to a local guy who imports Italian wines. He didn't buy them that year, but today he's delighted to have some of their wines. 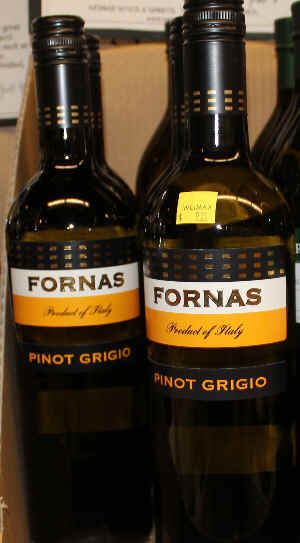 The brand is Fornas, as the Bidoli family purchased an old brick-making factory and converted it into a winemaking facility. 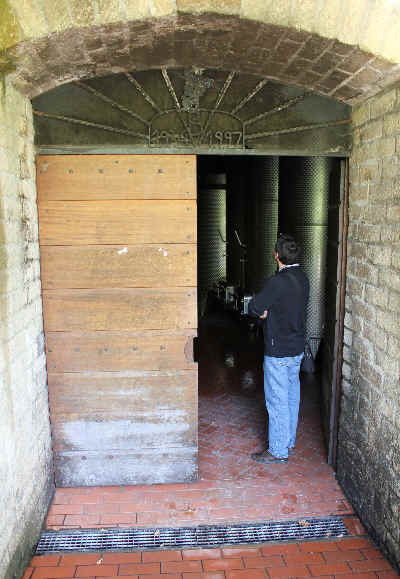 The old "furnace" now houses stainless steel tanks and some oak barrels as they produce a nice range of Friulian wines. Pinot Grigio is a delight in terms of both taste and price. It's a non-wooded wine and it's fresh, dry and reasonably crisp without being shrill. The Sobon family has been making good Amador County wines since the late 1970s. Back then vineyard land didn't cost an arm and a leg like it does today. As a result the Sobon family has been making sensibly-priced wines for a few decades. So many California wines selling for less than $15 usually have a "California" appellation and come from over-cropped vineyards in the Central Valley. These wines are typically soulless and "empty," relying on some sugar to fill in the gap left by poor quality grapes. Meanwhile, Sobon's "Old Vine" Zinfandel comes from good, sustainably-farmed vineyards in Amador County in the Sierra Foothills. The youngest vines are 35 years of age and the oldest are just over 100. The wine is matured in seasoned American and French oak barrels, so the bright berry Zinfandel fruit is prominent here. As this is on the softer side of the spectrum, we like popping a bottle in the 'fridge for 30 to 60 minutes to get it to cool cellar temperature. It's one of the few bargains in California wine. This is a modest estate and they don't toot their own horn in promoting their wine. This fellow is their winemaker. He's not famous but damn he makes good wine. "We're not in the business of selling vanilla here. 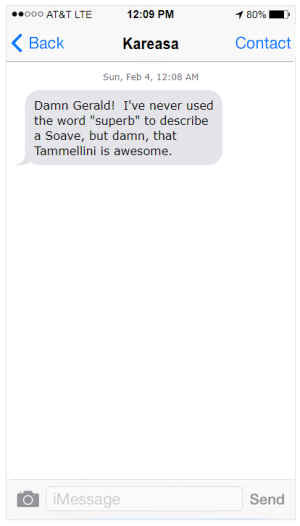 We make Sangiovese." 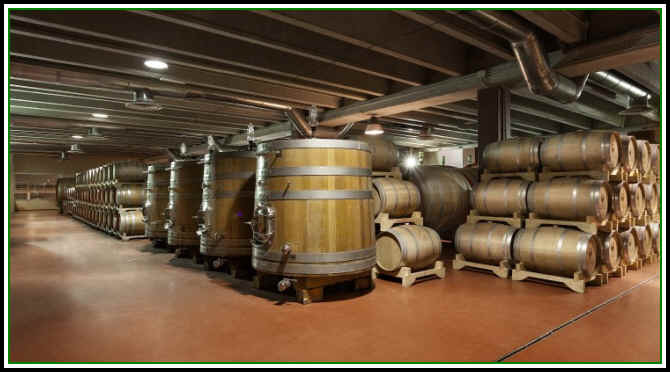 And, as you can see, the wines are matured in botte grande, large wood vats which allow the wine to develop and soften without contributing a forest-full of oak to the wine. We taste the wine every year before purchasing a new vintage and have to say this fellow knows what he's doing. There's modest vintage variation, but the quality of each year is always good and the wine is priced a bit below the market. All over Portugal, wineries told customers their red wine was made from the Periquita grape. Finally a court declared that the Periquita name was a "brand" owned by the Jose Maria da Fonseca winery and that only they had the rights to the name "Periquita." It's a bit reminiscent of the usage of the terms "Xerox" and "Kleenex." Anyway, we have Jose Maria da Fonseca's "Periquita," a wine made of the grape known around Portugal as Castel�o. This is an easily drinkable, simple red wine. Berries...smooth. Medium bodied. The current bottling of Morrona's little Chianti is Delicious with a capital D! It comes from a lovely winery that's close to Pisa (hence you'll notice it does not say "Chianti Classico" on the label as it's outside that appellation area. The estate comprises about 500 hectares but only 90 are devoted to vineyards. The cellars are in an old monastery. 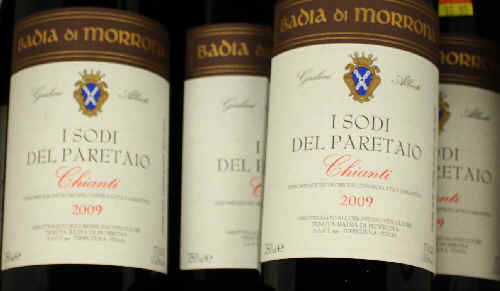 It's snappy Sangiovese called "I Sodi del Paretaio" and the wine is medium-bodied and brightly cherryish. 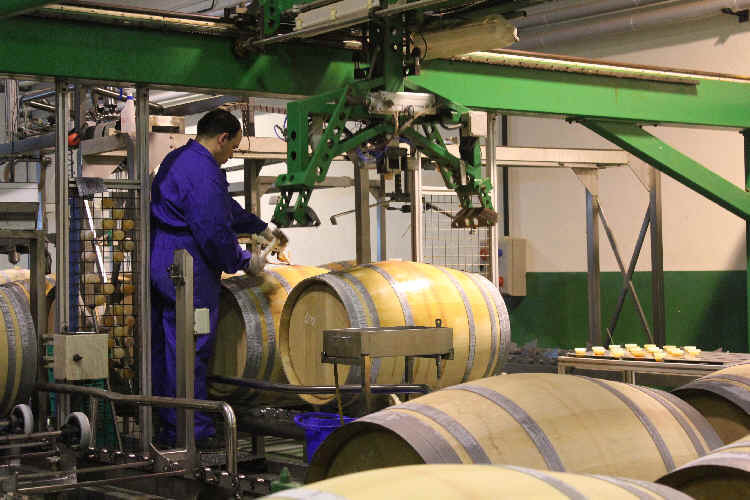 The wine does not see any oak, as they leave it in stainless steel or cement tanks. Not fancy, but for Spaghetti & Meatballs, Lasagna or Italian Sausages on the grill, this is a nice accompaniment. It's way out in the middle of nowhere and it's a beautiful little property cultivated by a charming couple who are dedicated to making good wines (and a reasonable prices, too!). The wine is predominantly Sangiovese but the modest 'twist' here is they rather specialize in a blending grape called Ciliegiolo. Ciliegie are cherries and the wine actually displays a nice cherry-like quality. It dove-tails beautifully with their cherryish Sangiovese and the wine is intended for immediate drinking. It's not a cellar-worthy wine, though a year, or two, in bottle is certainly possible. As the wine is bright and fruity (but dry with snappy Sangiovese acidity), we like to serve this at cool cellar temp. Pop your bottle in the 'fridge for maybe an hour to get it to 55 degrees, or so. 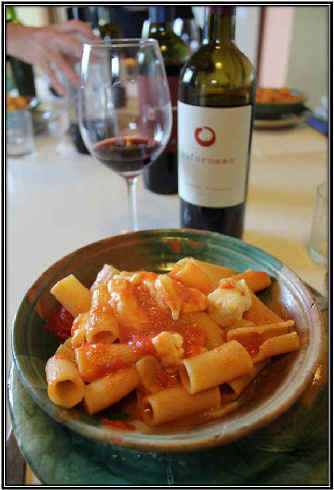 The wine pairs handsomely with rigatoni and tomato sauce (as seen above), but it's a good accompaniment to sausages, pizza, etc. * By the way, the allegedly low-priced places offer this for $19.99 or $17.99 if you buy six bottles and another place is $14.99. The Sobon family makes some terrific and well-priced California wines in the Sierra Foothills. Their "Rocky Top" bottling is less fruity than the "Old Vines" listed above on this web page. It comes from a high-elevation site where you'll find some seriously old vines...some are 100+ years of age and produce a small, but flavorful crop. The wine sees a bit of American and French oak, with perhaps 30% of the barrels being brand new. This contributes a mildly woodsy spice note in the wine. The tannin level is low and the wine is remarkably showy. The Romarins estate is a small, family operated property in the Southern Rh�ne Valley. We became familiar with their wine when we chided a sales rep for not bringing any interesting wines for us to consider adding to the shop. She only came by to take orders for wines we'd had from some California producers. One day she called to say she had something she thought we might like. Romarins C�tes du Rh�ne was excellent and the several succeeding vintages have also been good and well-priced. The wine is typically a bit higher-than-normal with its percentage of Syrah (45%) and a mere 30% Grenache...there's perhaps 20% Carignane and 5% Mourv�dre. The grapes are all hand-harvested and each variety is vinified separately with a fairly long maceration, nearly 3 weeks. The resulting wine has a lot of "soul" for a modestly-priced Rh�ne red. Berries and a touch of spice...perfect with lamb or well-seasoned beef. It shows well in its youth and we would not be surprised to find it cellars well for maybe 3-5 years. The Malvasia grape can make a wonderfully floral and intensely aromatic wine. Bonny Doon had produced good Malvasia and the guy who gained much experience there launched his own label, Birichino, and is making this wonderful wine today. This has such a beautiful fragrance...perfumy and reminiscent of jasmine blossoms and a fruit basket, though the wine is actually dry despite all the "sweet" fragrances. Pairing it with Asian dishes is ideal, though a seafood salad with pineapple or mango works well, too. There's a most amazing red wine produced in small quantities in Italy's Marche region. But there's a red grape called "Lacrima di Moro d'Alba" which grows around the town of Moro d'Alba. Many people expect this name to refer to a wine from Piemonte, since there's Dolcetto, Nebbiolo and Barbera d'Alba. The grape nearly had died out but it's on the rebound and makes a wonderfully distinctive red wine that you'll either love or hate. The color is dark and inky. The fragrance and flavors, though, poured into a black glass (so you can see the color) would be identified by most experts as some sort of Gewurztraminer. The fragrance shows notes of grapefruit and rose petals, much like great Gewurztraminer from Alsace or the Alto Adige. We generally chill a bottle of this to cool cellar temp. It pairs with all kinds of foods...best with nicely seasoned dishes, though. Pork, chicken, turkey...we had it with some Chinese take-out and it was brilliant! Our friend Jorge Ordonez, who imports some stupidly-expensive red wines for people who believe if they don't spend a load of cash for a bottle of wine, it must not be any good, brings in some far more drinkable bottles with small price tags. 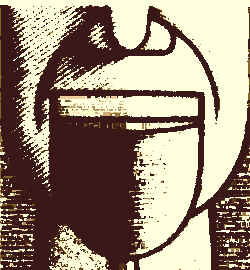 One such wine is this one, carrying a phrase Jorge is known to utter on a regular basis: Wrongo Dongo. Someone suggested he ought to have a wine with that catch phrase and he took their advice and one of his producers made the wine for him. It had a cartoonish face on the label, too. But then there was some dust-up and the winery and Jorge parted company. This situation was, to be blunt, Wrongo and Dongo. But Jorge now has another producer making the wine for him and it's a delightful wine with lots of red fruit notes. It's meant for immediate drinking, so if you're thinking of saving a bottle for a few years we'd say this to you: "Wrongo Dongo." This is a wine for drinking tonight or over the next year. It's a good little wine for a large crowd. The Monastrell grape (Mourvedre is France and Mataro to some Spanish speakers) can make a hard, astringent red. But this was vinified to be consumed the same day you buy it. Best at cellar temp...pair it with informal foods, sausages, burgers, roasted chicken, paella, grilled pork chops, etc. From Bodegas de Sajazarra in Spain's Rioja we have this lovely little classic Rioja called Solar di Libano. Now there are many famous wineries in Rioja. This producer is, frankly, not so famous. But maybe they ought to be given the quality of the wine and the remarkable price. This producer grows its own grapes. They do not buy fruit from neighbors or on the open market...only from their own, estate vineyards. They claim to farm responsibly, too. And they say their wines are not filtered, in an effort to get the most character into the bottle. This wine is 97% Tempranillo with the balance being Graciano and Garnacha. The wine is matured in small American and French oak for about a year and a half and then it's racked into large wood before bottling. Medium-bodied and fairly supple on the palate, this is a delightful ten-buck red wine. It is ideally paired with grilled red meats. Setting it up with a beer or glass of sparkling wine is ideal, making the contrast so great, you'll think you spent serious money on this bottle. The Masi winery has been making a special, proprietary wine called Campofiorin since the 1964 vintage. In Tuscany, back in those days, it was not uncommon for a winemaker to add some dried skins of fermented grapes back to a tank of Chianti...this would add body and maybe round out the wine a bit. In 1964 the winemaker at Masi was so pleased by the quality of the skins from their Amarone wine (made of dehydrated grapes) that he couldn't bear to simply discard them...so he put them into a tank of Valpolicella. The wine began to ferment and the resulting wine was of good quality, so it became a normal protocol for Masi. 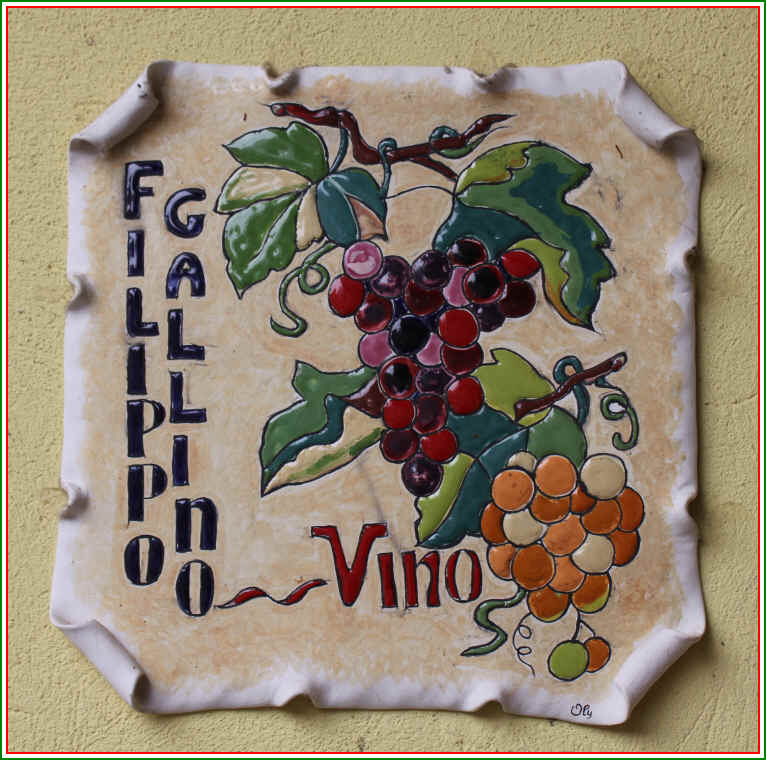 They named the wine Campofiorin, after a vineyard site of Valpolicella. And they trademarked the word "ripasso," so neighboring vintners are obliged to pay a royalty to Masi if they use that term on their label. And many do. Now they call their technique "Double Fermentation," as they use a small amount of dried grapes from their Amarone program and use those to encourage this second fermentation instead of the press cake from their Amarone wine. They make a serious quantity of Campofiorin these days and it's a surprisingly soulful red wine for such a large production. Medium-bodied...nice red fruits with a ripe, warm character...this focuses on the fruit and not oak. If you're serving a long-simmered meat sauce with your pasta dinner, consider this. We've also enjoyed it with some grilled sausages. Pizza, too, come to think of it. Stop by the shop...we'd be delighted to show you our latest discoveries.